We at Fine Art Bartending have been teaching bartenders for more than 35 years now in Vancouver alone. Across Canada, more than 45 years. We keep teaching how to bartend because in only 2 weeks, our top rated bartending course continues to change lives. We see students come in not being able to pour a single shot, and less than 2 weeks later… finish the class with confidence and land a job as a bartender weeks later. At Fine Art, we pride ourselves in serving confidence. If you are thinking of how to start a bartending career, keep in mind that the cost of bartending school pales in comparison to how much money can be made. That just can’t be said of pretty much every other profession! A Bartender in a great establishment can make $200-$300 per night in tips plus an hourly wage (probably minimum wage). Starting a bartending career in an entry-level type bartending job at a slower pub, or catering company is going to make AT LEAST $80 a night in tips, plus your hourly wage of $12 per hour. In a 6 hour (average) shift, at an entry-level bartending job your making about $25 per hour, in a high end bartending job, closer to $50 per hour. And, of course, it’s all cash. You could end up in a great, high-end bartending job right out of bartending school, it does happen, but if all you can find is an “entry-level” bartending job, stay 3-6 months, and then take your certificate, and now your experience, and go find a job at a place where you can make higher tips. Bartending School is cheap and only 2 weeks of your time. With the income potential, even at an entry-level job, you can pay off the tuition in a week of work or less. You can end up making more money per hour than the friend of yours that just spend 4 years and $40,000 on university, or $7000 and a year at haircutting school. There is something satisfying about creating beautiful cocktails on a daily basis. Artists know this satisfaction. Craftsmen and construction workers also know what we mean. As a bartender, you create tasty beverages that your customers instantly reward you for. 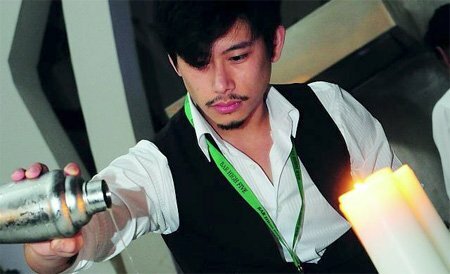 A great bartending school can coach you on how to make that customer experience memorable, while maintaining proper bottle holding and drink mixing techniques. You cant learn to be a smooth confident bartender at home standing behind your kitchen sink, reading cocktail books & watching videos online. The best way to learn anything is to do it, over and over, in different scenarios, and of course with the right equipment. It helps to have an experienced instructor keeping a close eye on your progress and correcting any mistakes as you go. That’s what we offer at Fine Art Bartending School. Hands-on learning, behind our bar, with the right equipment & experienced instructors. Meet new people and interact in a social atmosphere. There is no better job than bartending for meeting every different personality this world has to offer. Every day is a new adventure with new customers. You will meet new people in your bartending school class and on the job. Are you looking to expand your social circle? Fine Art Bartending School will definitely help you out with that! Bartending is also a great way to meet anybody you are looking to meet, network for your other projects. You will be amazed who you might meet when standing behind a bar. Every day will bring a new group of people into your establishment with opportunity for you to interact with them in a fun relaxed atmosphere. Want to work full time? No problem. Want to work part time, & go to school, keep a day job etc.? Bartending might just be the perfect part-time job. Bartending offers flexible hours, and you could work lunch shifts, evening shifts, or into the wee hours of the morning. A bartending career will always make you money. Bartenders use their skills to travel the world. Many of our students have gone on bartend in Australia, Cayman Islands, Europe & Asia. There are Fine Art Bartending School graduates working just about everywhere you can think of. Bartenders are needed everywhere, it’s a skill you can take with you wherever you go. 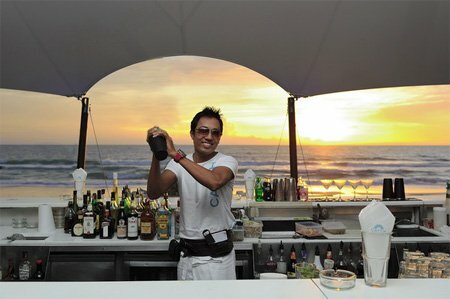 All of our instructors have experience bartending overseas, ask them how they did it! Once you start, you will continue to bartend all throughout your life. It is a skill that will never go to waste. At any house party, you can go into any liquor cabinet and put together a drink, or two, that will impress your guests. And of course, you can always make a nice cocktail for yourself.